We Will Beat Any Deal In The USA! Call Alex "The Van Guy"
We make it easy to purchase from us, at YOUR conversion dealer, Beck & Masten GMC Superstore. Check out the available new Texas GMC Savana conversion vans from our on-line inventory. Whether you want an all wheel drive, a hightop, lowtop or even mobility conversion vans. We have 7 or 9 passenger extended conversion vans available. Beck & Masten has a new conversion van that will fit your budget and tastes. 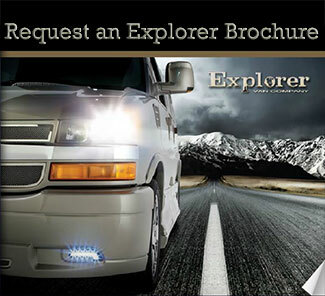 We can help pre-qualify you for your NEW GMC Explorer Savanna in the privacy of your home or office. You can custom order a special luxury conversion to meet your family vehicle needs and tastes. Whether you want a base model or the top of the line Limited SE, our professional sales staff will help you on the road to your adventure today with our full line of luxury Explorer conversion vans. The best part is, it never costs extra to order your dream van from Beck & Masten Conversion Van Superstore.